If you’re searching for a comprehensive sewing book, then the Reader’s Digest Complete Guide to Sewing is your perfect guide. Tim Gunn, co-host of Project Runway says “and I always recommend the Reader’s Digest Guide to Sewing. It’s very comprehensive and very user-friendly.” Inside this book you’ll find colorful step by step illustrations for making clothes and home accessories. It has something for the beginner sewer as well as an experienced seamstress. Not only will you understand the terminology but you’ll see the techniques as well. In this updated edition, sewers will find 20 new modern projects from Simplicity patterns; tips on how to select the right equipment, choose the perfect fabric, and use the right technique for every project; instructions for making clothes, curtains, and other home accessories; and more. photographs Instructions for making smart trousers, traditional curtains, a light summer dress, kids' clothes, a beach towel, patchwork bag, and more Tips on how to select the right equipment, choose the perfect fabric, and use the right technique for every project Foolproof ways to discover the perfect pattern size and how to incorporate only the most flattering design details. From casual clothes, to evening wear, from curtains to quilts, the New Complete Guide to Sewing brings you everything you need to know to sew your own distinctive creations. 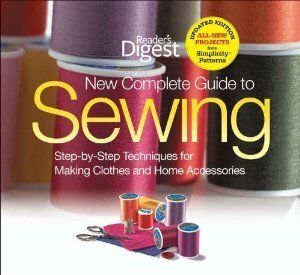 Whether you are a beginner or an accomplished sewer, using this book is like having a sewing expert sitting alongside you every step of the way! Book Review: "When a struggling new fashion-designer needs to hone their sewing skills, Project Runway guru Tim Gunn steers them to this "Reader's Digest Guide to Sewing." It's got the best, clearest, and most complete introduction to 95% of the sewing skills you'll ever need. It's practical and methodical in its instructions. Not as good as grandma, but anyone will be able to pick up stitches, cutting, and machine use from it." The ultimate stitch-and-seam reference book for both beginners and seasoned sewers includes thousands of illustrations and diagrams for each stage of the sewing process. In this updated edition, sewers will find: 20 new modern projects from Simplicity(r) patterns; includes updated photographs Instructions for making smart trousers, traditional curtains, a light summer dress, kids' clothes, a beach towel, patchwork bag, and more Tips on how to select the right equipment, choose the perfect fabric, and use the right technique for every project Foolproof ways to discover the perfect pattern size and how to incorporate only the most flattering design details.